Figaro and Susanna plan to get married - but their master Count Almaviva has designs on Susanna and is determined to stop the wedding taking place. Meanwhile the page Cherubino's passion for the ladies jeopardizes his job, and Countess Almaviva longs to regain her husband's love. Le nozze di Figaro was Mozart's first collaboration with Lorenzo da Ponte, who also wrote the librettos for Don Giovanni and Così fan tutte. The opera is based on Pierre Caron de Beaumarchais' controversial play Le Mariage de Figaro. This play was banned in Vienna due to its potentially seditious content, and Da Ponte had to excise much of its political content in order to get the opera accepted for performance. Figaro was a success in Vienna, and even more so in Prague, where Mozart reported 'nothing but Figaro!' was heard. It has remained one of the composer's best-loved works. 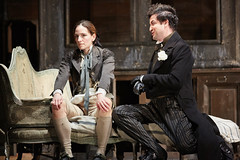 The score of Le nozze di Figaro is packed full of wonderful arias covering a huge range of emotions, from the humour of Figaro's ironic farewell to Cherubino ('Non più andrai') to the poignancy of 'Dove sono', as the Countess remembers past happiness. The opera also contains remarkable ensembles, such as the closing scene of Act II, in which Figaro's plans unravel at breakneck speed. As so often with Mozart, forgiveness is a key theme, and the Count's Act IV plea to his wife, 'Contessa, perdono', is one of opera's most moving moments. David McVicar sets the action in a château in 1830 on the eve of France's second revolution, exploring the political and class conflicts at the core of Beaumarchais' play, but also maintaining Mozart and Da Ponte's humanity and wit.